Why not invest in our most important resource? Many TEDs/Indian Educators are aware of the great needs but few are able to convince tribal leadership and tribal membership that an investment in our children will have greater returns than any of the current per capita distributions and some of the short lived limited tribal services. Our tribal educators need courage and encouragement to go against the grain of status quo tribal policies. Our tribes have become too dependent on external funding (from Head Start to College Scholarships) to serve our tribal members when they need funding and support. Here is a great article on why it is so important to invest more in our education. U.S. tops spending on education, what about tribal spending? Here is an article that shows that the U.S. spends more on education that most other nations. 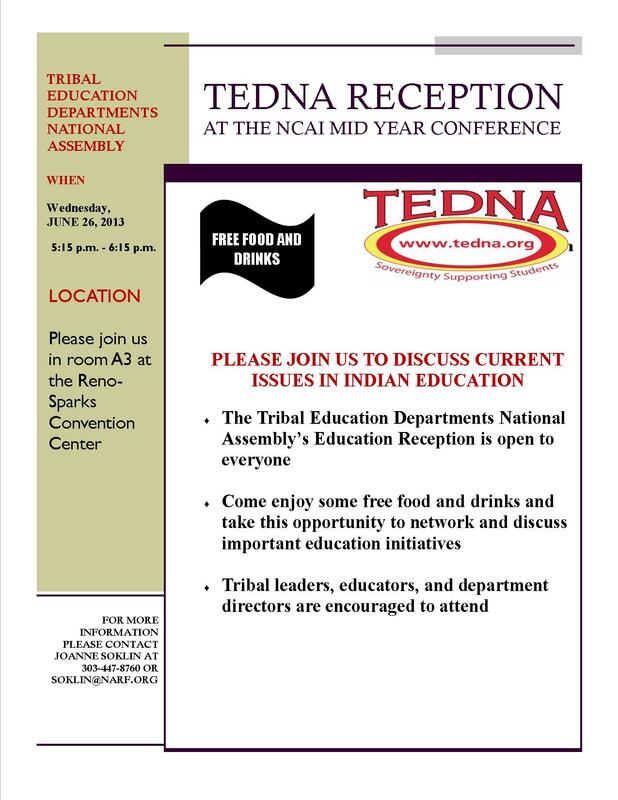 Quinton Roman Nose, TEDNA’s Executive Director, is interested in seeing a study on tribes to see what is the average expenditure for per tribal student from external (federal and state) funding and internal (tribal nonfederal funds) funding from pre-school to college. The New Mexico Delegation has introduced a Bill in the House of Representatives and the Senate to improve Indian education. The Senate Bill can be seen here. The House version can be seen here. TEDNA will hopefully have some analysis in the near future of these identical bills. The Strengthening America’s Schools Act (“SASA”), S. 1094, is the Senate Health, Education, Labor, and Pensions (“HELP”) Committee’s most recent bill to reauthorize the Elementary and Secondary Education Act (“ESEA”) and was marked up on June 12, 2013. The SASA makes some helpful reforms to education law and policy, but it notably lacks many provisions requested by Indian Country. TEDNA’s S. 1094 Concerns highlight some of the priorities of TEDNA that were not included in S. 1094.